Pickup truck cab styles come, go and change, but their basic configuration stays the same. We here at Route 15 Used Car Center are major fans of pickups, and we love nothing more than demystifying confusion surrounding truck cab styles. Here's a basic cheat sheet of truck cab styles listed from largest to smallest. Mega and CrewMax are different names given to the same design by different manufacturers. This cab style consists of four front-hinged doors of equal size. Rear seats have storage space behind them, and the truck bed is on the short side. Crew cabs have four full-sized, front-hinged doors and a full rear seat for daily commutes, group nights out or brief family road trips. 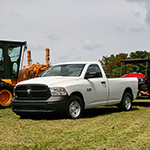 Double, which Ram refers to as "Quad," resembles a four-door sedan attached to a pickup bed. The doors have conventional front hinges, and there's a rear seat with a bit of leg room. Regular cab is your classic two-door pickup with no rear seat or space behind the rear seat. Extended cab is notorious for its two front doors, both front-hinged, and its two rear doors with rear hinges. The rear doors can only open after the front doors open, hence the nickname "suicide" doors.